Here at Maloncho it is our philosophy to make your visit an enjoyable experience. Our new restaurant opened April 5th 2015 to enhance our existing Take Away Business. The design and flavour of our Restaurant have been put together by our concept creators to give a rich and welcoming feel. Our reputation speaks for itself with an array of food hygiene certificates and numerous awards of Excellence over many years. We have also introduced some delicious Indian fish dishes which are already proving popular. You’re only a phone call away from your very own taste sensation, check out our Menu. 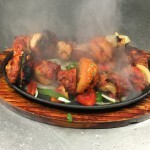 What are you waiting for give us a call now to book your table or to get your Takeaway delivered.